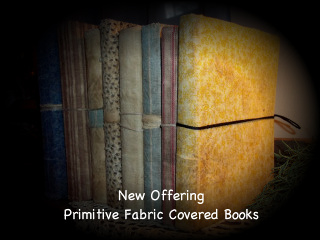 Wonderful Fabric Covered Books with early copyrights. Perfect to add to your Primitive Gatherings, many different aged fabric dust covers to choose from. Fabric covers are completely handstitched for the earliest of looks. Featured books...Greg Shorthand Dictionary c. 1929 & 1930 (2), Webster's American International Dictionary c. 1950, The Murders of Rue Morgue & Stories by Edgar Allen Poe & more. I currently have seven fabric covered books for sale..colors available Blue, Brown & Mustard Calico....Red, Blue & Brown Stripe....plain & simple, you'll love them!